The 2018/19 Chartered Institute of Arbitrators New York Branch Writing Competition (“Competition”) is a scholarly writing competition open to students engaged in the full-time study of law within the territory of the Chartered Institute of Arbitrators New York Branch (“CIArb NY Branch”), as described below. Participation consists of the submission, in accordance with these Rules, of a scholarly article equivalent in scope and quality to a law review student note on a topic of the student’s choice directly related to international commercial or investor/state arbitration. There will be no financial charge to participate in the competition. The Competition is open only to JD, LLM and JSD students who are enrolled full-time for the 2018/19 academic year at any ABA-accredited law school located in the CIArb NY Branch’s territory (i.e., anywhere in the States of New York, New Jersey or Connecticut). Participants must represent that they meet the foregoing qualification at the time of submission of the article. Participants may submit only one article and may compete in only one Competition. All participants must comply with all Competition rules and deadlines. If any Application is submitted in an incomplete or untimely manner, the submission will not be accepted for consideration in the Competition. Be available for publication by the Chartered Institute as set forth below. As a condition of receiving any award, each award recipient must: (a) agree that the Chartered Institute shall have the option, but not the obligation, to publish their article, subject to any publisher’s edits; (b) submit the article to the Chartered Institute, pursuant to the Institute’s instructions, for publication in a Chartered Institute publication of the Institute’s choice; and (c) be solely responsible for all taxes applicable to such award. At the time of submission, the article must be unpublished and unsubmitted for publication in any other publication. Any publication permitted by the Chartered Institute or following the period in which Chartered Institute permission is required shall include an appropriate legend pre-approved by the Chartered Institute or by the CIArb NY Branch, stating the relationship between the article and the Competition. The Competition will be administered by a Competition Organizing Committee (the “Committee”) consisting of CIArb NY Branch members. The Committee will appoint a panel of CIArb members to serve as judges for the Competition. The scoring of the judges will be final subject only to verification by the Committee of the judges’ compliance with the Rules. The Committee will have discretion to replace any judge who, in the Committee’s judgment, for scheduling or other reasons, is unable to perform his/her duties in a timely manner. The Committee, at its discretion, may revise these Rules and publish such revised Rules on the Website. Decisions made by the Committee shall be final, binding and non-appealable. 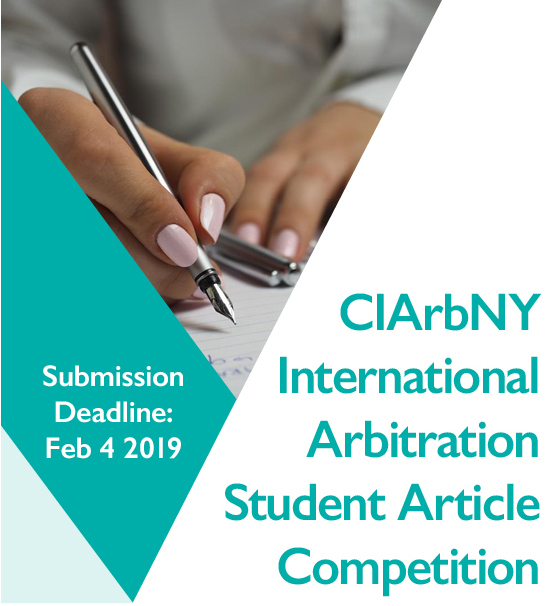 The CIArb NY Branch, at its discretion, may publish on the Website the titles of the winning articles, the names and law school affiliations of the authors, and the prizes awarded. In the event of any discrepancy between these Rules and any other communication, including the announcement of the Competition dated August 3, 2018, these Rules shall govern. A week-long systematic and comprehensive examination of the law and practice of international arbitration. The course features both lecture and interactive segments and is designed for arbitrators, advocates, in-house counsel and others interested in international arbitration. The course is a CLE (CPD) course for which NY State CLE credit will be available. Upon completion, all attendees will receive certificates of completion from Columbia Law School and the Chartered Institute. 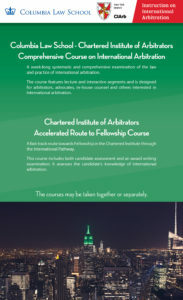 A fast-track route towards Fellowship in the Chartered Institute through the International Pathway. This course includes both candidate assessment and an award writing examination (CI Arb Module 4). It assesses whether the candidate has sufficient knowledge required to apply the principles and procedure of international arbitration based on the UNCITRAL Model Law and UNCITRAL Arbitration Rules. Upon successful completion of this course, an applicant will have completed all the course requirements for Institute Fellowship. The Comprehensive Course held annually in June in New York offers a week-long, systematic and comprehensive examination of the law and practice of international arbitration, presented by 23 leading international arbitration practitioners and academics. 2018 participating organizations included AAA/ICDR, ICC/SICANA, CPR Institute, CAM, DIFC, KLRCA, SIAC, GAR, JURIS, and Practical Law. 2018 law firm sponsors included host and Platinum Sponsor Hogan Lovells and Silver Sponsors Debevoise & Plimpton, Milbank, and Squire Patton Boggs. 2018 Columbia/CIArb NY Branch Comprehensive Course Directors Professor George Bermann, Thomas Halket and Richard Mattiaccio, and CLE coordinator Kabir Duggal (seated L. to R.); students from Australia, Brazil, France, Ghana, Korea, India, Italy, Lithuania, Mauritius, Mexico, South Africa, Trinidad and Tobago, UK and USA (standing). 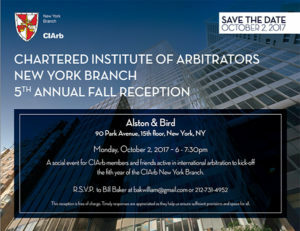 A social event for CIArb members and friends active in international arbitration to kick-off the fifth year of the CIArb New York Branch. This reception is free of charge. Timely responses are appreciated as they help us ensure sufficient provisions and space for all. A fast-track route towards Fellowship in the Chartered Institute through the International Pathway. This course, includes both candidate assessment and an award writing examination (CI Arb Module 4). It assesses whether the candidate has sufficient knowledge required to apply the principles and procedure of international arbitration based on the UNCITRAL Model Law and UNCITRAL Arbitration Rules. Upon successful completion of this course, an applicant will have completed all the course requirements for Institute Fellowship. The program will discuss specific ways to use the flexibility of arbitration to resolve patent-related disputes in a more efficient way than can be done in litigation. Topics to be discussed include effective case management techniques that involve a standard arbitration clause as well as innovative arbitration clauses that include special procedures. PANEL 2: Patent Law: A Public Policy Basis for Vacatur? The program will examine the circumstances under which a patent arbitration award may (or should) be denied recognition or enforcement under the public policy exception of Article V of the New York Convention. Topics to be discussed include how the public policy exception has been interpreted by American and European courts; what aspects of patent law, if any, qualify as Mandatory Law; and the intersection of patent and competition law. The Branch is a co-sponsor of this annual conference, which this year will focus on “New Developments, New Challenges, and New Ideas in International Dispute Resolution.” Panels will discuss the arbitrator’s role in settlement, emergency arbitrators and interim measures, the enforceability of awards set aside at the seat, issues in Latin America and cyber security and artificial intelligence in arbitration. Organized by conference co-chairs Benno Kimmelman and Edna Sussman, this year’s keynote speaker will be Gerald Aksen and the conference will feature a special pre-conference breakfast organized by ArbitralWomen on “Unconscious Bias.” Additional information about the conference can be found here. Please join the NYSBA’s International Dispute Resolution Committee, in cooperation with NYIAC and the Chartered Institute of Arbitrators’ New York Branch, for a three-part series on the inner workings of arbitral tribunals. We will explore different approaches to building tribunal cohesion and collegiality, organizing deliberations, delegating responsibilities among tribunal members and to tribunal assistants, and dealing with arbitrator misconduct. This series offers a unique opportunity for counsel to better understand how tribunals make decisions and for arbitrators to consider how they might be more effective as co-arbitrators or chairs. Organized by the Branch, this course is for those who seek Fellowship status in the Chartered Institute. Space will be limited and more information about this course will be provided shortly. This course will offer a systematic and comprehensive examination of the law and practice of international arbitration. Compressed into a week’s time with both lecture and interactive segments, the course is designed for arbitrators, advocates, in-house counsel and others interested in international arbitration. Save the date on your calendars. Registration information will be provided shortly. Hosted by Debevoise & Plimpton LLP and co-sponsored by NYIAC, this Branch program focuses on whether the arbitration community is paying adequate attention to data security in arbitration. Discussions include practical approaches for avoiding and handling data security breaches during an arbitration and sources of potential legal and ethical obligations relating to data security. The panel is organized and moderated by Stephanie Cohen, FCIArb, and the speakers include Mark C. Morril, FCIArb of Morril ADR, Jim Pastore and Jeewon Serrato both of Debevoise & Plimpton LLP and Edna Sussman, FCIArb of SussmanADR LLC. To register, please click here and provide your contact details. The Branch is also a supporting organization of this annual conference, which is chaired this year by Jean Kalicki of Arnold & Porter and Matthew Slater of Cleary Gottlieb Steen & Hamilton. Save the date on your calendars. More information about this conference will be provided shortly. The Branch is a cooperating entity of this New York City meeting, which features lively panels on international dispute resolution, including on “What You Don’t Know Can Hurt You: Ethics Considerations When Choosing a Seat of Arbitration,” “Proof of Foreign Law – A Comparison of the Approaches in U.S. Courts and in International Arbitration,” and “The Role of Mediation in Resolving U.S. Claims against Cuba.” More information about the conference and registration information can be found here. This New York Branch program and reception is designed for international LL.M. students currently enrolled at New York law schools. Panelists include Ank Santens of White & Case (Columbia LL.M. alum), Brian King of Freshfields (NYU J.D. alum) and James Berger of King & Spalding (Fordham J.D. alum). This is a Q&A panel followed by a reception. Branch members are invited to attend the 5:30 p.m. reception. Registration information about this event will be provided shortly. The Branch is a supporting organization of this annual GAR conference, which is organized in association with CAM/CCBC. Chaired by Eduardo Damião Gonçalves of Mattos Filho, Veiga Filho, Marrey Jr. e Quiroga and Adriana Braghetta of L.O. Baptista, Schmidt, Valois, Miranda, Ferreira & Agel, the sessions include “How Different and What are the Challenges of Arbitrations Involving States and State Entities?,” “Private vs. Public Disputes – a View from Inside,” “Anti-Corruption Legislation and Investigation Impacts – Leading Cases Around the World,” and “Focus on So-Called Guerrilla Tactics and Their Use in International Arbitration.” More information about the conference and registration information can be found here. Columbia Arbitration Day (CAD) 2016 will focus on cutting-edge issues in both commercial and investment arbitration. This year’s conference will consider new perspectives on issues that have long been accepted as canonical aspects of the system. Four panels will reevaluate preconceptions of international arbitration: the trends and prospects of class arbitration, the role of auxiliaries and associated conflicts of interest, challenges to the system’s legitimacy, and the enforcement of arbitral awards in situations of public international law violations. As a new feature, CAD 2016 will provide ethics credits in addition to CLE credits for an expected total of seven CLE credits. For further information and to register, please visit the CAD 2016 website here. This Asia-focused arbitration conference is organized by the North American Branch of CIArb and features an amazing group of speakers, including Sundra Rajoo from Malaysia, incoming Chartered Institute President and Director of the Kuala Lumpur Regional Centre for Arbitration and Teresa Cheng from Hong Kong, former Chartered Institute President and current Chair of the Hong Kong International Arbitration Centre. The conference brochure and registration information for this exciting practice-focused conference can be found here. Organized by CPR and hosted by Foley Hoag, this seminar will be an opportunity to discuss mediation with experienced mediators and practitioners from the United States and Europe. CPR will also introduce its new European Mediation & ADR Guide, a practical tool to help in-house counsel understand the benefits of mediation and how to use it effectively to resolve commercial disputes. The conference brochure and registration information can be found here. Overview: This New York Branch Centenary event will address the UNCITRAL Guide to the New York Convention and feature speakers from both New York and Vienna. The event will feature video-linked conference venues in New York City (at the Association of the Bar of the City of New York at 42 West 44th Street) and UNCITRAL’s offices in Vienna. A separate audience will be present at each venue. The event will be free, streamed onto the Internet for remote attendance, recorded and posted for subsequent free access through the New York Branch and UNCITRAL websites. An optional ticketed, paid lunch at the Princeton Club in Midtown Manhattan will immediately follow the conference for those at the New York venue and will feature Mr. Gerald Aksen (International Arbitrator and former General Counsel of the AAA) as its keynote speaker. 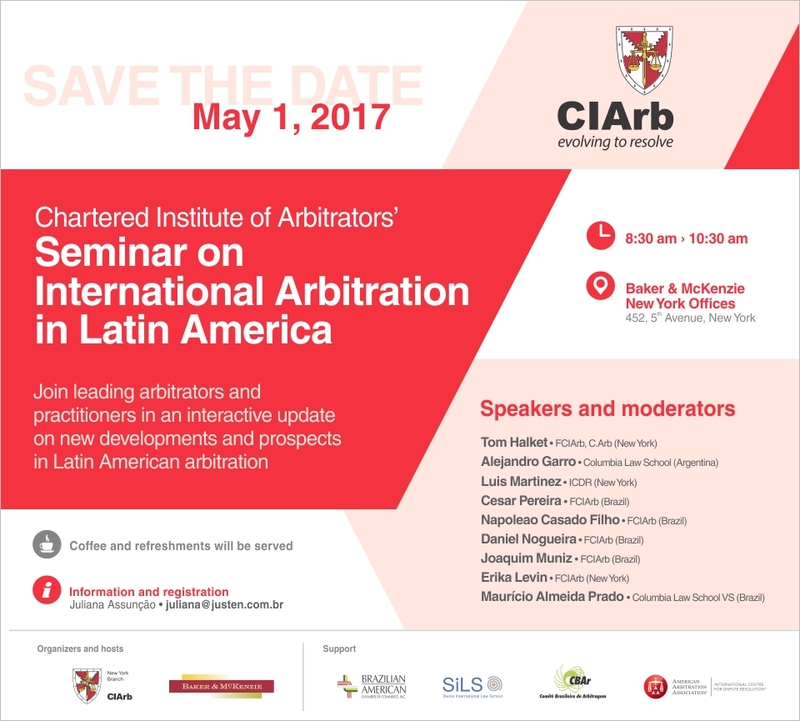 The Center for International Commercial and Investment Arbitration (CICIA) at Columbia Law School is a major sponsor of this event. Speakers: Speakers in New York currently include Professor Emmanuel Gaillard and Dr. Yas Banifatemi, both of Shearman and Sterling’s Paris office, and Prof. George Bermann of Columbia Law School. The Vienna speakers currently include Mr. Santiago Villalpando, Head of the U.N. Treaty Section, as well as Mr. Renaud Sorieul and Ms. Corinne Montineri, both of UNCITRAL. More speakers are currently being added to the program. This one-day event, co-chaired by Mark Friedman, Debevoise & Plimpton & John Fellas, Hughes Hubbard & Reed, will bring together an elite line-up of institutional and private practice speakers to discuss a variety of topics at the forefront of Arbitration. 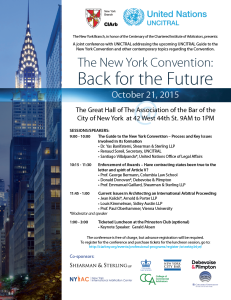 For speaker list and program updates, here: www.GlobalArbitrationReview.com/NewYork2015. CIArb members are entitled to a discounted registration rate. Overview: This conference will feature a panel discussion followed by a live remote examination, by videoconference, of an international arbitration witness. Counsel will be in Canterbury, England; the witness will be in New York. Session 1: 8:30 a.m. – 10:30 a.m.
Perspectives on the present and future use of technology in dispute resolution. COFFEE & TEA: 10:30 A.M. – 10:45 A.M. Session 2: 10:45 a.m. – 12:30 p.m. The session will include a remote arbitration witness examination, conducted by video-link, with our colleagues in the South East Branch in Canterbury, England. Tom Halket, New York Branch Vice Chair, will be participating from Canterbury. The State Bar of New York has approved this program for 4.5 CLE accreditation hours. 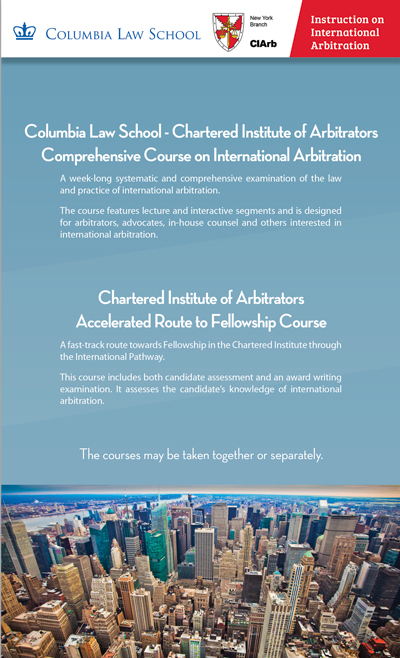 CIArb New York Branch Joint Columbia University Law School Course on International Arbitration. A systematic and comprehensive examination of the law and practice in international arbitration. The course, compressed into a week’s time with both lecture and interactive segments, is designed for arbitrators, advocates, in-house counsel and others interested in international arbitration. The course is jointly provided by Columbia University School of Law, through its Center for International Commercial and Investment Arbitration (CICIA), and the Chartered Institute of Arbitrators (CIArb), through its New York Branch. Topic: A 90-Minute Introduction for Contract Drafters, Litigation Counsel, IDR Advocates and Arbitrators. UNIDROIT Principles Working Group participants speaking from five video-linked locations will address practical topics and answer questions from all locations. A light lunch will be served in New York and Washington D.C.; refreshments will be served in London, Paris & Frankfurt. There is no charge for members of sponsoring organizations. Designed for potential parties in mediation and arbitration, the Workshops will take participants through the main stages of the WIPO mediation and arbitration procedures, including case management techniques. Participants may register for one or both Workshops. Join U.S. and Brazilian business leaders, government officials and sector specialists at the 2014 Brazil Infrastructure Investments Forum. We will continue to deepen the debate of strategic areas in the infrastructure sector and opportunities for investment in Brazil. When: February 28, 2014, from Noon to 2:30 p.m.
What Should Judges Do? A distinguished international panel share views of the judicial role in reviewing awards of investor-state arbitration panels, with reflections on Canada’s experience in the Cargill v. Mexico NAFTA case as we await the US Supreme Court decision in the BG Group v. Argentina case. A unique opportunity for international arbitration practitioners to improve their advocacy skills in a learning-by-doing workshop. Emergency relief for problems that will not wait.